Learn how to become a true master of HTML5 canvas in my new book. In it I teach you how to use all the major features of canvas, animate with physics, and how to create two awesome space games. Developers who already have significant experience with HTML5 canvas will probably not get much from this book (it's called Foundation HTML5 Canvas for a reason). However, the chapters on animation and making games may still prove useful to you. I would suggest checking out the preview of the book and deciding for yourself. Don't just take my word for it. Preview the book before you buy and you can be sure that it'll be money well spent. Already bought the book? Please take a couple of minutes out of your day to leave a review on Amazon. It will help out others, and I'd really appreciate it! Examples are used throughout the book. Download the source code to keep up, or even to just have a good nose around. Learn how to become a true master of HTML5 canvas in my new book. In it I teach you how to use all the major features of canvas, including how to animate with physics and how to create two awesome space games. 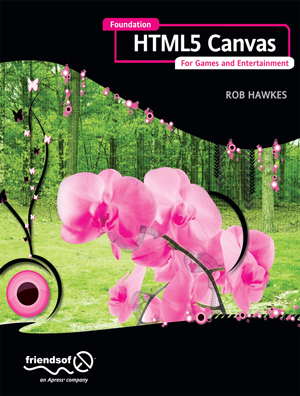 If you want to develop a good understanding of how to use HTML5 canvas and how to write games within canvas, this is the book for you.